Did you have plans for March of next year? I hope you weren’t getting married or anything because Sqaure Enix just announced that Final Fantasy XIII will drop on March 9th for PlayStation 3 and Xbox 360. I’m sure your fiancee will gladly delay the wedding. Let us know if saying “baby, you know I love you” still works after you’re two weeks deep in the Final Fantasy XIII storyline. 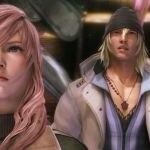 With the press release, Square Enix included a video that introduces the main characters of Final Fantasy XIII. This time around we have Lightning, Snow, Vanille, and Hope. Lightning is a powerful female character who I’m guessing is either very fast or has the ability to electrocute people. Snow wears some kind of stocking on his head; I hope this foreshadows some burglary side missions. The last two characters, Vanille and Hope, lack a lot of description. We’re told that Vanille is a “vulnerable girl” and that Hope is “sensitive.” Since Hope’s gender wasn’t specified, your guess is as good as mine. The biggest news to come out of Square Enix’s press release besides the launch date is that Leona Lewis’s song “My Hands” is the official Final Fantasy theme song. I listened to the song on YouTube and can report that the lyrics tackle the subjects of lost love, loneliness, and sorrow. In the YouTube comments for the song, YouTube user “haloavenger” stated “MEDIOCRE﻿ COMPARED TO JAPANESE VERSION.” I agree, haloavenger; I would have liked the song more if I wasn’t able to understand the lyrics. But maybe I’m not the best audience for “My Hands.” I have another request for big Final Fantasy fans. If you get so engrossed in Final Fantasy XIII that Chinese food is delivered to your house night after night because you lack the time and energy to feed yourself, if the delivery boy bringing this food is there so much that your distraught financee rides away with him on the back of his scooter, let me know if Leona Lewis’s “My Hands” takes on a deeper meaning.